General Bibliography-occurring at the end of each volume, this extensive bibliography contains all sources used anywhere in the commentary. 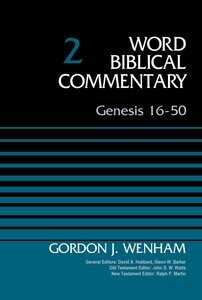 About "Genesis 16: 50 (Word Biblical Commentary Series)"
Gordon J. Wenham (Ph.D.,University of Cambridge) is professor of Old Testament studies at the University of Gloucestershire. He is the author or editor of ten books, including major commentaries on Leviticus (New International Commentary on the Old Testament), Genesis 1-11, Genesis 12-50 (2 volumes, Word Biblical Commentary), The Book of Numbers (Tyndale Old Testament Commentary). He is co-editor of the Apollos Old Testament Commentary series in which he is the author of the volume on The Book of Psalms.